World’s Best Vegetarian Omelette, for a healthy and happy start of your day. It is too easy to make, and the secret to an absolutely great omelette is using fresh ingredients. You’d be surprised how this omelette tastes like a restaurant one. Low carb, gluten free recipe. I might be able to skip lunch or dinner, but l can’t possibly start my day without breakfast. I’m like an engine that does not work without fuel. 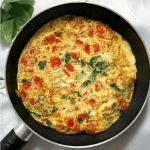 An omelette is filling and gives you the energy you need to get going. 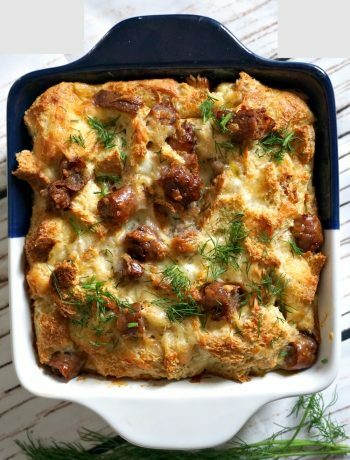 This recipe makes one big portion, in case you are really hungry, or share it with one more person, and it’s still a filling and delicious breakfast. Omelettes are so easy to make and only require a few unexpensive ingredients, but, of course, you can adapt this recipe to your own taste. Also, some people like egg white omelettes only, in which case you separate the yolk from the white and follow the same simple steps. My husband is a big fan of egg white omelettes, he never has the yolk, but I usually go for the whole thing. I don’t buy it that eggs are bad for cholesterol. How do you make a good vegetarian omelette? Making an omelette is super easy, but you need ONE GOOD NON-STICK PAN if you want your omelette to look good, and not like scrambled eggs. Moreover, always grease the pan, whether with oil or butter, just a small amount would do. Crack and add the eggs to a bowl, beat them with a fork and season with salt and pepper. Once the butter is melted, add the beaten eggs, and spread over evenly, tilting the pan to ensure you get the same thickness. Leave to cook undisturbed until the edges start to cook, but there is still raw eggs in the middle. Now you can add your toppings, then carefully flip the omelette over with a spatula, and leave to cook on the other side. And that’s your omelette! Easy, right? 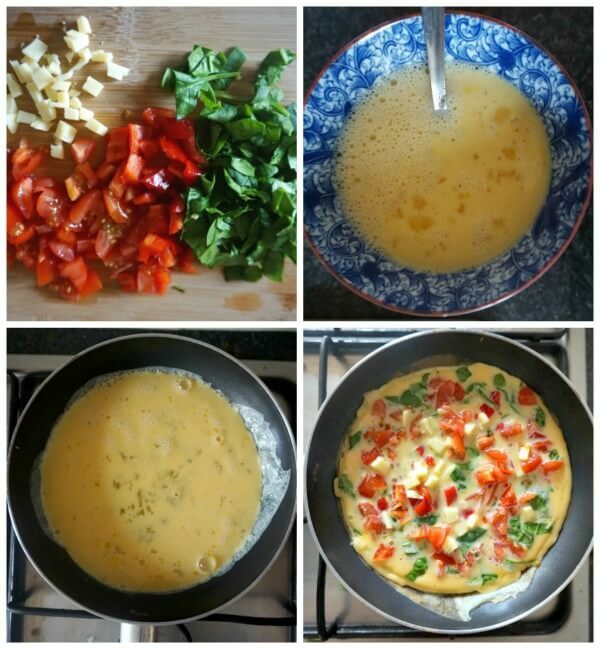 What can you add in omelettes? The answer is pretty much anything you like. Cooked bacon, cooked chicken, cooked any other meat, salmon, or any fish you like. Then we have veggies, spinach, kale, arugula, mushrooms, tomatoes, onions, garlic, peppers, zucchini, and the list is endless. Grated cheese is just amazing, parmesan, cheddar, gouda, again, whatever you have in the fridge. Just make sure you don’t overcrowd the omelette, as it won’t be easy to flip it over to the other side. 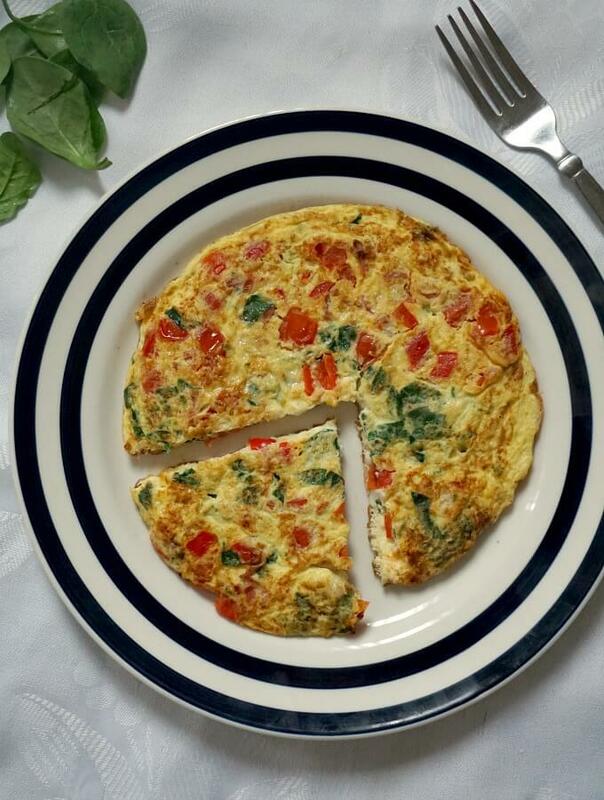 My 2-egg and veggie omelette has 279 calories, so good healthy breakfast to fuel you up with energy. For some more healthy breakfast ideas, how about my egg muffin cups? I probably mentioned it before, by my parents live in the countryside. Oh, heavens above, that is the real life! Everything is fresh and healthy, chickens running everywhere eating grass to their hearts’ content. And, as we know, happy hens lay happy eggs, right? I must say that whenever I buy eggs from the supermarket, I always go for the free range ones. I want to think they are a tad healthier than the eggs coming from caged chickens. Although, I would not be surprised if they are as unhealthy. God knows what these birds are fed, as long as the producers’ pockets are full at the expense of the poor consumer. But hey ho. 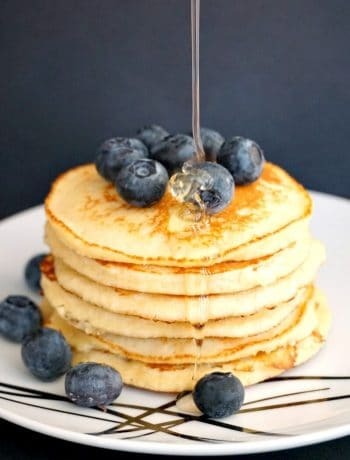 Looking for some more breakfast ideas? 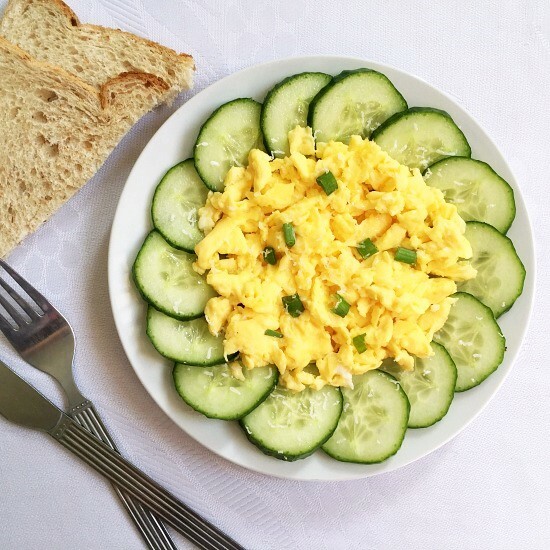 What about some Fluffy Scrambled Eggs with parmesan? They are some seriously nice eggs. 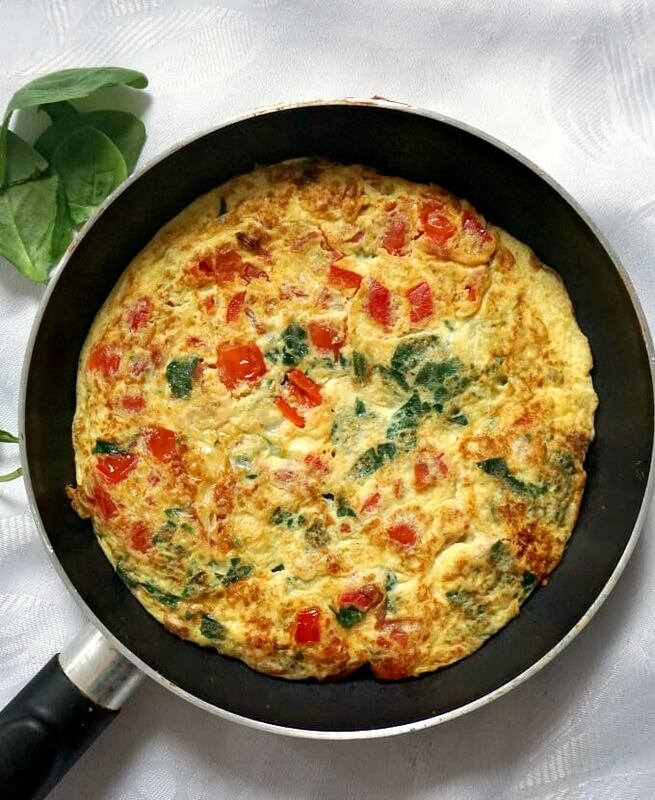 If you’ve liked the VEGETARIAN OMELETTE or any other recipe on the blog then don’t forget to rate the recipe and let me know how you got on in the comments below, I love hearing from you! You can also FOLLOW ME on FACEBOOK, and PINTEREST to see more delicious food and what I’m getting up to. 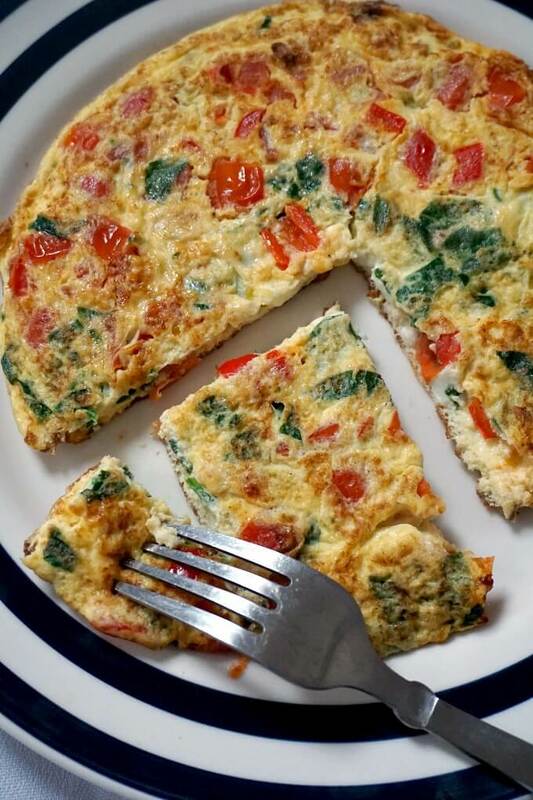 World's Best Vegetarian Omelette recipe for a super healthy and so delicious breakfast. This is not an ordinary omelette, but the very best. Cut the cherry tomatoes, red pepper and spinach leaves. Beat the eggs with a fork and season with salt and pepper. Add the mixture to the pan and spread it out evenly. When it starts to firm up, but still has a bit of raw on top, add grated cheese and also the cherry tomatoes, spinach, and red pepper. Using a spatula, ease the edges and quickly turn it over onto the other side. The other side will cook a lot quicker, it only needs about 1-2 minutes. When it is done, place a large plate on top of the pan and flip the omelette as fast as you can. I love omelettes! What I normally do is cook the veggies and the eggs separately, and then fold the eggs over the veggies. But tomorrow morning I will try your method. Wish me luck! I hope you will like it, thank you for stopping by ?